Plenty of hard work has clearly gone into this tight and energetic production of Fame the Musical. With a slight reworking of the choreography by director Karen Bruce from her previous tours, the ensemble set about their dance routines with precision and attention to detail. It's attractive stuff, which fulfils the remit of being entertaining. As for serving the plot, however, there is no sense in the musical and dance performances that this is a bunch of students who join a school and learn new techniques or mature over the course of three years. Admittedly, each snapshot number does have its own internal dynamic. 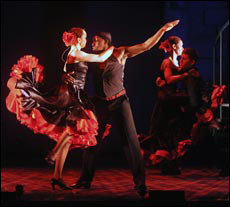 There are technically strong performances from the likes of Spin as illiterate dancer Tyrone, Holly James as the tragic Carmen and Nicholas Larkin as Schlomo, the classical musician trying to come out from under his famous father's shadow. There is more of an arc from the acting students. Nikki Davis Jones is nicely naive as Serena, overawed by Tommy Sherlock's overtly focussed Nick. Only Jon-Sel Gourkan fails to convince, his wisecracking Joe Vegas doesn't have the natural swagger that the character demands. For the teachers, Beverley Trotman proves a strong casting choice as draconian English teacher Miss Sherman. She provides a clear narratorial element between numbers and her rendition of These Are My Children finds the nub of the song's sentiments - without being sentimental. Intelligent structuring - and the inclusion of Fame itself - gets the audience on their feet and away home happy. Yet it is without the satisfaction of a story well told.